The Super League Greece (Greek: Ελληνική Σούπερ Λίγκα) or Super League Souroti for sponsorship reasons, is the highest professional football league in Greece. It was formed on 16 July 2006 and replaced Alpha Ethniki at the top of the Greek football league system. The league consists of 16 teams and runs from August to May, with teams playing 30 games each. As of August 2017, Super League Greece is ranked 14th in the UEFA ranking of leagues, based on performances in European competitions over the last five years. Since the foundation of the first official Panhellenic Championship in 1927, only six clubs have won the title, with the "big three" of Greater Athens (Olympiacos, Panathinaikos and AEK Athens) dominating and only Aris Thessaloniki, PAOK and AEL managing to break their dominance on few occasions. 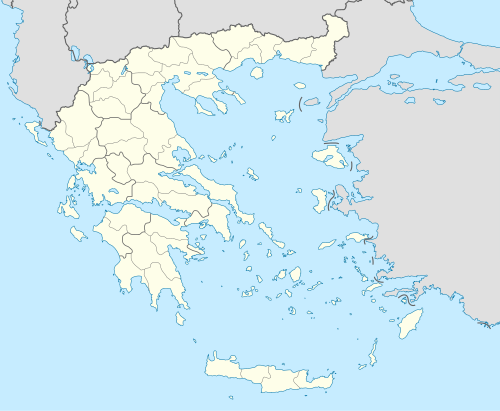 The current champions are PAOK, based in Thessaloniki, Macedonia, Greece. Between 1905 and 1912, a Panhellenic Championship was organised by the Hellenic Association of Amateur Athletics (SEGAS). This championship was actually a local tournament among clubs from Athens and Piraeus. After the Balkan Wars and World War I, two football associations were formed, one organising a football league in Athens and Piraeus, and one doing the same in Thessaloniki. These were the Athens-Piraeus FCA (EPSAP) and the Macedonia FCA (EPSM). In 1923, a Panhellenic Champion was determined by a play-off game between the Athens-Piraeus and the Thessaloniki champions. Peiraikos Syndesmos won 3–1 against Aris Thessaloniki. This panhellenic final was not repeated the following year as the EPSAP was split into the Athens FCA (EPSA) and Piraeus FCA (EPSP) following a dispute. In 1927, a national championship was organised in the form of a round-robin tournament between the champions of the three governing bodies. Panathinaikos, Olympiacos and AEK refused to participate and Aris Thessaloniki won the first title, finishing ahead of Ethnikos Piraeus and Atromitos. This national championship was set up again in 1929, and over the next years evolved into a tournament in which multiple teams took part. Still, these teams had to qualify for the national championship through their local football competitions. In 1959 the Alpha Ethniki - the precursor of the current Super League - was set up as a national round-robin tournament. The 1959–60 championship was the first to be held in national form after several months of talks. It started on Sunday 25 October 1959 with the participation of 16 teams. The creation of a championship in the form of a single permanent national category rather than the way they have been held until then with the participation of the teams selected by the local competitions was a requirement of both the State and UEFA. The first wished to establish a fixed number of matches every Sunday in Greece to stimulate interest in PRO-PO while UEFA wished to nominate national champions with strict criteria and through joint events for all states. The Hellenic Football Federation (HFF) was obliged to proceed to the abolition of the competitions of the Football Clubs Associations (EPS) of Greece as qualifying stages for the Pan-Hellenic Championship. The first place was taken by Alpha Ethniki, a single category with clubs from all over the Greek territory and a stable participation, with the exception of those who would be relegated at the end of the season. The initial design provided for a number of teams well above the 10th of the 1958–59 Pan-Hellenic Championship and in particular 18 which, as the expanded category program would cover almost all the available dates of the year, would no longer participate in its local competitions their EPSs. Those would be the qualifier for the upcoming national category and not the participation in the final round of the current championship, so their significance was significantly reduced. On Saturday, October 10, 1959 at the General Assembly of the HFF, ie with the participation of all the members of the Association of Football Associations and in the presence of the General Secretariat of Sports (GGA) and representatives of the Karamanlis government, became the first national category of Greek football. The 1st game was set for 15 days. According to the general Assembly of HFF in 29 August 1959, it was decided that the newly created Alpha Ethniki would consist of 18 teams, with their determination being made in accordance with the positions in the local EPS competitions in the period 1958–59. The HFF, at its decisive General Assembly on Saturday, October 10, decided to reduce the number of teams to 16 so that the racing program will not be extended in the summer. After the end of the first event in the summer of 1960, the teams did not increase despite HFF's initial intention, with the number 16 being considered the ideal for a championship in Greece and only 18 in 1967. The top four at the EPS Athens Championship: Panathinaikos, Panionios, AEK Athens and Apollon Smyrnis. The top four in the EPS Piraeus Championship: Olympiacos, Ethnikos Piraeus, AE Nikaia and Proodeftiki. The top four in the EPS Macedonia (Thessaloniki) Championship: Aris Thessaloniki, PAOK, Apollon Kalamaria and Iraklis Thessaloniki. The top two in the North Group of the Regional Championship: Doxa Drama and Megas Alexandros Katerini. The first in the two Sub-Groups of the South Regional Championship: Pankorinthiakos and Panegialios. On October 25, 1959, the Alpha Ethniki was launched. Panathinaikos won the first Alpha Ethniki's Championship, which became the champion of Greece for the fourth time in his history. He scored at 79 points with AEK Athens and beat 2–1 in the barrage, a match where he needed only a tie result in the neutral Georgios Karaiskakis Stadium. In such a case, after the half-hour extension, the competition announcement set the best goal difference. Through barrage and with the same score was also the third place for the demotion, with the winner Panegialios to overtake Pankorinthiakos again in the event of a draw. The scoring system was 3p the win, 2p the draw, 1p the defeat. Time has been relentless for some teams that have participated in the first league of the Alpha Ethniki. The historic Ethnikos Piraeus, cup winner of Greece in 1933, participates in the Gamma Ethniki, as well as Proodeftiki while AE Nikaia participates in the local championship of Piraeus. Apollon Pontus, Doxa Drama and Iraklis Thessaloniki are fighting in the Beta Ethniki, while Pankorinthiakos, a few years after joining Alpha Ethniki, merged with Aris Korinthos and created PAS Korinthos, which reached the Alpha Ethniki at the 90's and is now participating in the Gamma Ethniki. Megas Alexandros Katerini is the ancestor of Pierikos. In 1961, they merged with Olympos Katerini and created Pierikos who plays in the Gamma Ethniki. On 19 January 1979 a bill was passed in the Hellenic Parliament under which football clubs became Football Incorporated Companies (PAE or ΠΑΕ in Greek). The Association of Football Incorporated Companies (EPAE, ΕΠΑΕ in Greek), under the supervision of the HFF, has since held the responsibility to hold the championship, with Makis Ithakisios being elected its first president. Initially the shares were owned by the sports union to which the football club belonged. Yet soon after, prominent Greek businessmen (shipowners, oil magnates, bankers etc.) began acquiring the newly formed PAEs by buying the majority of their shares, and then increasing their share capital, thus turning Greek football into a fully commercialised and highly profitable business for the decades to come. For a single racing season, 2000–01, the championship is renamed "Upper Category". On July 16, 2006, was founded the copartnership Super League. Members of the copartnership are the PAE's that have the right to participate in the professional football championship of the First Division. The main activity of the copartnership is the organization and conduct of the First Division's Championship according to the regulations and decisions of the Hellenic Football Federation (HFF) and the supreme international football confederations (UEFA, FIFA). At present, 16 clubs compete in the Super League, playing each other in a home and away series. At the end of the season, the bottom two clubs are relegated to the Football League. In their place, the top two teams from Football League are promoted. The number of teams to be relegated may change, depending on a licensing procedure that takes place at the end of the regular season. The Super League is currently entitled to two entrants into the UEFA Champions League. The Super League champion directly enters the second qualifying round of the UEFA Champions League. The second through fifth place teams in the Super League enter a play-off for the second Greek entry. The play-off winner enters the UEFA Champions League's second qualifying round, a four-legged tie from which the winner advances to the play offs of the UEFA Champions League. The winner of the Greek Cup qualifies for the third qualifying round of the UEFA Europa League. In the play-off for the UEFA Champions League, the teams play each other in a home and away round robin. However, they do not all start with 0 points. Instead, a weighting system applies to the teams' standing at the start of the play-off mini-league. The team finishing fifth in the Super League will start the play off with 0 points. The fifth place team’s end of season tally of points is used to calculate the sum of the points that other teams will have. The point difference of each of the 2nd, 3rd and 4th team from the fifth place team is then divided by five (if the result is a decimal number it is then rounded to a full number, with 5 or more being rounded up) and the resulting number respectively for each team is the number of points with which they will start the mini-league. For the 2017–18 season there will be no playoffs for the Champions League and the Europa League spots. The following 16 clubs will compete in the Super League during the 2018–19 season. Kerkyra and Platanias were relegated to the Football League for the 2018–19 season, while OFI and Aris Thessaloniki, as winners and runners-up, were promoted from the 2017–18 Football League season. * Season 1959–1960 marked the beginning of the Alpha Ethniki - the precursor of the current Super League - as a national round-robin tournament. The number of seasons that each team (in alphabetical order) has played in the top division from 1959–60 until 2018–19. A total of 68 teams had competed in at least one season at the top division. Olympiacos, Panathinaikos and PAOK are the only teams to have played in the top division in every season since the league's inception in its modern form. The teams in bold participate in the 2018–19 Super League. APOEL avoided relegation in the 1973–74 season, but were forced to play in the Cypriot A Division the following season due to the Turkish invasion of Cyprus. Hence they are the only team to have played a single season in the Greek league and not been relegated. This index is an overall record of all match results, points, and goals of every team that has played in Alpha Ethniki and Super League championships since 1959–60. The table is correct as of the end of the 2011–12 season. Points are based on 3–1–0 and no deductions are counted. Note: Ionikos had 5 points deduction in the 2006–07 season. All the geographic regions of Greece have been represented by at least one club in the first national division. Central Greece has had the strongest presence with 26 clubs overall, of which 21 come from Attica alone. Central Greece, Macedonia and the Peloponnese together contain almost three quarters of the clubs that participated in the top flight. Between 1967 and 1974, the Cypriot champion also participated in the Greek top competition, and five different Cypriot clubs participated during those years. The Greek islands of Rhodes, Lesbos and Corfu have also been represented. A total of 73 clubs have participated at the first tier so far. Based on an idea of Umberto Agnelli, the honor of Golden Star for Sports Excellence was introduced to recognize sides that have won multiple championships or other honours by the display of gold stars on their team badges and jerseys. As of 13 December 2018, the Greek Super League ranks 13th in the UEFA coefficient database, with 27.400 points. Nova Sports (premium channel) have taken the broadcasting rights for the home games of nine teams of the Super League. The teams are AEK Athens, AEL, Asteras Tripolis, Levadiakos, OFI, Olympiacos, Panionios, PAOK and PAS Giannina. On August 9, 2018, a two-year contract with the management of the Super League is signed by ERT. The contract provides for the coverage of 105 matches in the first season (2018–19), with provision for coverage of the 2019–20 season, alongside the restructuring of professional football categories of Greece. The contract covers the broadcasting of the home games of Apollon Smyrnis, Aris Thessaloniki, Atromitos, Lamia, Panathinaikos, Panetolikos and Xanthi. Eurosport has pan-European broadcasting rights for the Super League (except Greece and Portugal). From 2007 to 2017, the Super League had title sponsorship rights sold to one company, which were OPAP. From 2017 until today, the Super League has title sponsorship rights sold to the company Souroti. OPAP' deal with the Super League expired at the end of the 2016–17 season. The Super League announced on 20 July 2017 that the new title sponsorship deal for the Super League was with the Souroti company. As well as sponsorship for the league itself, the Super League has a number of official partners and suppliers. The official ball supplier for the league is Adidas who have had the contract since the 2011–12 season when they took over from Nike. Also, Panini has held the licence to produce collectables for the Super League since 2008, including stickers (for their sticker album) and trading cards. ^ a b c d "List of Greek champions" (in Greek). Hellenic Football Federation. Retrieved 16 April 2012. ^ "Football League". Epae.org. 23 August 2010. Retrieved 14 October 2015. ^ "Αποφάσεις Γ.Σ. και Δ.Σ. 18/8/2017"". superleaguegreece.net. 18 August 2017. Retrieved 18 August 2017. ^ Astrachan, Αναρτήθηκε από. "Greeksporhistory: Η ιστορια του Ελληνικου ποδοσφαιρου". ^ a b c d e f g h i j k Kárpáti, Tamás; Schöggl, Hans. "List of Greece championships". RSSSF. Retrieved 12 April 2012. ^ a b "Olympiacos F.C. history". olympiacos.org. Retrieved 22 April 2012. ^ a b "Olympiacos profile". FIFA.com. Retrieved 22 April 2012. ^ a b "Panathinaikos F.C. trophies". pao.gr. Archived from the original on 19 January 2016. Retrieved 12 April 2012. ^ a b "Panathinaikos FC profile". uefa.com. Retrieved 12 April 2012. ^ a b "AEK honours". aekfc.gr. Archived from the original on 6 May 2012. Retrieved 22 April 2012. ^ "Greece - All-Time Tables". Rsssf.com. 31 January 2007. Retrieved 14 October 2015. This page was last edited on 24 April 2019, at 19:46 (UTC).